This was the very first book I published. It's short and an easy fast read. As artists, we don't always know what galleries are looking for. We try sending them our portfolios in the hopes that they will fall in love with our work and agree to represent us. We buy lists of gallery email addresses and send out hundreds of emails in the hopes that one of them will respond. We put together a killer website with load of fabulous photos in the hopes that a gallery owner will find us. Well, I've been on both sides. I have been an artist for over 20 years and a gallery owner for three. As an artist, I know how hard it is to get up the courage to approach a gallery. As a gallery owner I know how hard it is to say no to an artist. I created this guide so you, the artist, could get an idea of my process for choosing art. There were several questions that I asked myself when looking at the art and the artist. 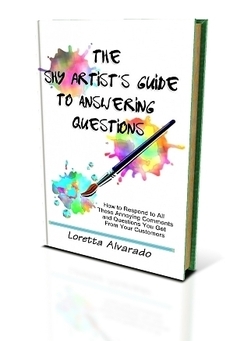 This book explains why those questions are important and how you can use them to increase your chances of getting gallery representation. You can scroll through the entire book below. Enjoy! If you liked that book, you might want to have a look at this one as well. This is my favorite of all of the books I have published. I had lots of fun writing this one. Does this match my sofa? This will look great in my bathroom. My kid can paint better than that! No thank you, I'm just looking. If you struggle with getting the right words out, then you need to read this book.